Hurom Juicer Reviews- Which Hurom Juicer to Buy? 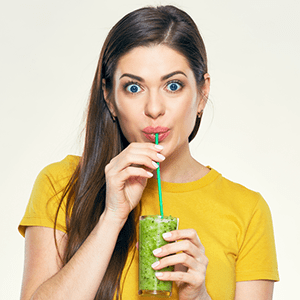 Due to indomitable popularity, lots of companies manufacture cold press juicers. Hurom is considered as one of the most popular cold press juicer companies in the world. Many juicing enthusiasts even count it the prominent juicer company in the world. It distributes slow juicers in more than 50 countries all over the world. The company moreover patented several slow juicer techniques. The Hurom has been blessed with many notable awards including Red-Dot Award, 2013 Good-Design Award, IDEA Award, and 2014 IF Design. In last few months, I have tested several types of Hurom juicers. My acquirement is that “Hurom is a ‘fantastic machine’” and I am in love with it. Meet my new juicers and see why I have loved these stylish and efficient juicers. 6 How Does A Hurom Juicer Work? This section is going to continue my Hurom juicer review by focusing on the Hurom HU 100 slow juice. The Hurom HU 100 is a first generation model that comes with the standard 10-year motor warranty I love so much. I will cover the main features of this model further below as we continue with my Hurom slow juicer product review. The Hurom slow juicer HU 100 model does an impressive job when it comes to juicing. The average yield is increased by as much as 35% thanks to its patented slow squeezing technology. This is great for those of us who want to make sure that each ingredient is used as efficiently as possible. As far as operation goes, the Hurom HU100 is very easy to assemble and operate. The pieces click together very well and provide a secure fit. When it comes to juicing, the wide mouth chute is great for larger fruit and vegetable pieces. When it comes time to cleanup, most of the parts are dishwasher safe making this process quick and easy. The motor is powerful and very efficient. However, you will be surprised at how quiet it is when you are juicing. The motor operates at only 80 RPMs and uses only 150 watts of energy resulting in a reduction in noise production. This makes it an excellent choice for those of us who live in close quarters with our neighbors like condos and apartment complexes. Another great juicer that I decided to mention in my Hurom slow juicer review is the Hurom HH Elite Juicer. This is another first generation model that comes with the standard 10-year warranty on its motor. It also comes with a handy recipe book full of juice recipes. Below are the main features of the Hurom Elite juicer. The Hurom juicer uses the same slow squeezing technology as its counterpart above. This results in yield increases of up to 35%. However, this model lacks the Ultem strainer and auger that the Hurom HU 100 has. This means that it still does a great job processing most fruits and vegetables, but it is not as efficient as the Hurom HU 100. When it comes to ease of operation, the Hurom Elite juicer is very easy to use like its HU 100 counterpart. The pieces snap together very easily, and the safety mechanism prevents operation until it is assembled correctly. This is great for those of us with small kids at home. Also, most parts are dishwasher safe making cleanup a breeze. If you’re looking for a juicer that is powerful yet quiet, then the Hurom Elite series is another great choice for you. The motor only uses 150 watts of power and is surprisingly quiet while in use. There is one major drawback of this model compared to the HU 100 above. This model operates at 43 RPMs. This is almost half that of the 80 RPMs offered by the other model reviewed. Why do I like this expensive (a bit) juicer? – Many of my friends ask this and my answer briefly “Hurom H-AE slow juicer is a juicing expert”. With an upscale machinery design and slow juicing technology, Hurom H-AE Slow Juicer will significantly change your life. 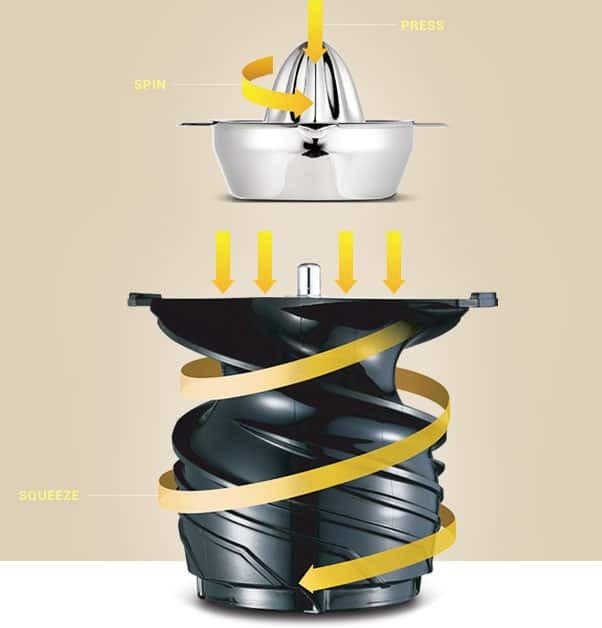 Each Hurom slow juicer comes with a supercar inspired design. H-AE features an instinctive power button which remembers a handy automotive experience. Only 43 RPM of the juicer gives you hand squeezing juicing experience. Most parts of the Hurom juicer is made of food-grade materials. The parts that exposed with food are BPA free. Along with technological advancements, its amazing design attracts many of the juicing enthusiasts. I especially like its eye-catching design, suitable dimension (10.6 x 16.9 x 7.1 inches) and very reasonable weight of 14.3 pounds. The dual hopper is a new feature of Hurom that enables you to juice any type of fruits and vegetables of various sizes. It manages perfectly leafy greens and root vegetables. But my experience says that it amazingly works with soft ingredients. The 150-watt motor makes the machine efficient and quiet. It makes about ‘no noise’ and you can make your favorite juices at any time without disturbing others. Safety sensor controls the operation and lessens the risk. A built-in cooling system prevents overheating. In my 2 years usage, I didn’t need to replace any parts of the juicer. However, if you need to make a replacement, you can find any specific parts on the Hurom website. It was lurid when I found in many Hurom slow juicer reviews that Hurom HP slow juicer doesn’t use any blades. I just wanted to try this new invention (to me) and purchased Hurom HP 8 months ago. With great pleasure, I am still using this for most of my daily juicing tasks without any hassle. Hurom’s personal series like HP juicers are designed to meet everyday juicing needs. The juicer is made of 100% BPA free materials. Hurom’s Ultem strainer are 8X well-built than usual plastics. There is no sharp edge in the machine that bothers you when juicing. The strong safety sensor only allows operation when the chamber correctly assembled in the machine. The cooling system features integrated heat vents that prevents overheating. Fitting sized feed chute can keep ingredients easily. I have found this juicer perfect for soft and hard produce, leafy greens, citrus fruits, and nuts. Sometimes, I make sorbets and the yield is just awesome. Hurom’s 150 watt AC motor doesn’t make any noise. Rotating speed only 43 RPM which just ensures peaceful environment. With one thing I am a bit bored and that is cleaning the screen, especially the bottom. Don’t worry; other parts are very easy to clean. This excellent slow juicer comes with 10-year warranty for motor and 2-year parts warranty. 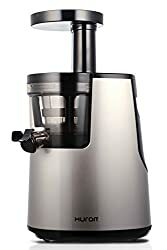 Masticating juicer already offers superior juicing results compared to their centrifugal counterparts as mentioned above. However, Hurom’s slow squeeze technology is designed to maximize the effectiveness of the mastication technique. The juicer works slowly and efficiently to ensure that the juice produced retains as much nutritional quality as possible. This includes nutrients that are prone to rapid oxidation like vitamin C.
How Does A Hurom Juicer Work? To understand how these Hurom juicers work it is important to understand the difference between mastication juicers and centrifugal ones. Mastication juicers work by squeezing and crushing a variety of fruits and vegetables to produce nutritious juice. On the other hand, centrifugal juicers work by spinning ingredients at high speed to separate juice from the pulp. The Hurom juicers work by slowly and gently crushing ingredients to produce juice that is as nutritious as possible.They then push the pulp through a special strainer that is designed to separate as much juice as possible resulting in increased yields and lighter and drier pulp. Once this process completes, you are ready to enjoy your nutritious and delicious juice. Powerful Motors: One common element that most Hurom juicers share is their powerful motor design. This ensures that the juicer can handle even the toughest fruits and vegetables. Impressive Warranties: Another great feature of Hurom juicers is the standard 10-year warranty on their motors. They also have a 2-year warranty on other parts that provides a great sense of confidence in their product design. Mastication Technology: Hurom juicers use the mastication method to extract juice. This results in improved nutrition and increased juice yield. 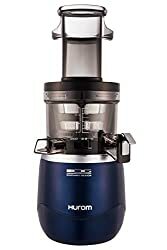 Compact Design: The compact design of Hurom juicers is another great plus for those of us with limited cabinet space. Most juicers can easily fit in the cupboard when not in use. BPA Free: Another great feature of Hurom juicers is that they are BPA free. This is a great benefit for those of us concerned about potentially harmful chemical exposure. Longer Juicing Times: One downside of Hurom juicers is that it takes longer to produce your juice. This is due to the slow juicing technology that helps to ensure your juice retains as much nutritional quality as possible. Slight Price Increase: Another slight drawback of Hurom juicers is that their purchase price is slightly higher than some comparable models. Are the products dishwasher safe? Most product pieces are dishwasher safe. Some sensitive parts like the screen require hand washing. 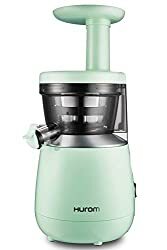 Do I have to cut ingredients before feed into Hurom juicer? Some ingredients may prove to be too large for the chute. If this is the case, simply cut them into smaller pieces before inserting. Are Hurom juicers suitable for making nut milk? Yes, these products can process nuts into nut milk. Hurom juicers are constructed to provide dependable juicing results and incorporate powerful motors. However, in terms of superiority, the Hurom HU 100 series outshines its Hurom HH Elite cousin. It has a motor that is almost twice as powerful and features construction materials that provide enhanced durability and crushing power. This makes the Hurom HU 100 the best choice for those searching for an excellent juicer.